The Dura is a twin track system for 4mm glass sliding doors on bi-passing cabinet and cupboards. 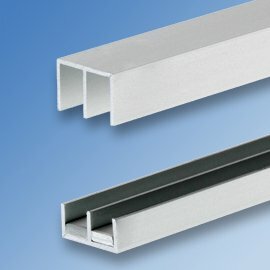 The top and bottom track are precision aluminium profiles in a silver anodised finish. The bottom track has grey nylon continuous slides. Normally supplied in kits containing top and bottom tracks complete with slides. No glass drilling or cutting required.